Looking for an adventure this summer? 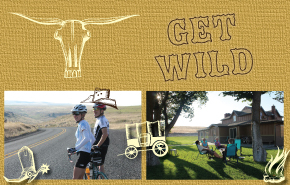 How about an outback tour of the Wild West of Oregon while you relax at a ranch and are guided to the very best cycling routes. TREO Lodge is an an Eastern Oregon hunting ranch that has recently reinvented itself as a vacation destination for urban cyclists who want to explore this strikingly desolate area. All­ inclusive packages are available for groups of four people or more and feature fully supported bike tours, meals and lodging at the dramatic 300-acre spread near the Hardman Ghost Town in Heppner, Oregon. Amenities include a hot tub for relaxing at the end of the day, a personal beer tap, pool table and of course, breathtaking views from the porch. The area is so sparsely populated that cars are a rare sight on local roads and bicyclists enjoy wide berth. Rides can be customized depending on each group’s ability and desires. Proprietors Phil and Kathy Carlson say some of the best riding is along the Stagecoach Trail, which follows the path of the original stagecoach from the Hardman Ghost Town through the Blue Mountains and Umatilla Forest to the John Day River. They’ve also crafted a historic ride through the rolling hills of Oregon farming country that winds its way to the Old Western town of Condon, where visitors can stop at an old­ fashioned pharmacy, soda fountain and mercantile. The proprietors are dedicated to ensuring their guests have a memorable experience, and are completely amenable to customized adventure days. Perhaps you want to ride to Kimberly, the confluence of the John Day and John Day North Fork rivers for lunch, rafting, or fishing, then continue riding. If you choose a rafting option, the guides will transport your bikes to the put out, and handle all the gear for you. Riding Cycle Oregon? Spend some leisure time with TREO to loosen your legs and acclimate yourself to Eastern Oregon so you can make the most of your Cycle Oregon experience. Whether you’re looking for extensive riding, heaps of adventure or plenty of relaxation, this new riding retreat offers it all in a small, customized setting. My friends and I are looking into a trip with treo. I love the option to do side advenures, especially since I’m the only one in our group who is waaaay into the biking aspect (I could do just biking all day!!!) and the others will enjoy the diversions. Thanks for posting this – don’t know how I would have learned about it otherwise.